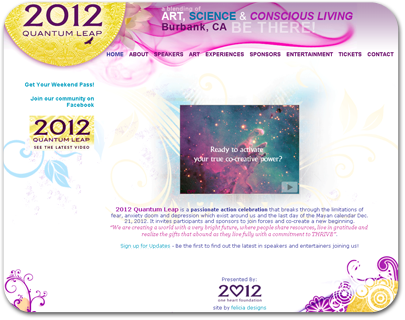 About: The 2012 Quantum Leap Event offers a new context for our lives and the times we are in. It is time to step beyond doom and gloom and discover our true power! Empower Your Quantum Leap! Join Us in LA this March!. Job Responsibilities: Client wanted a website to inform visitors about the upcoming conference.
. : : :: Home | About | Web | Graphic | Portfolio | Contact :: : : .